I am excited to announce that the second collection I did for Urban Outfitters is online now! These pictures were taken by the talented Shannon Sewell as part of a photoshoot we did last week-it was so much fun and Shannon is so sweet. I can't wait to share the rest of the shots! wow, just gorgeous!!! you are so incredibly lucky! It's interesting how you've never worn a pair of your urban outfitters shoes on the site. Nor has your mother. i love those brown wedges. great job jane! congratulations! i cant wait to go scope it out! Gorgeous! I love the look of the black ones, have a kind of archaic cintage feel. And you're right. The photography is so gorgeous! I was thinking its a litle Tim Walker-esque. That black and white shot with your sketches in the corner is particularly nice. You must be so lucky getting to work with all these photographers and organisations! I'd like to say a massive thankyou for replying to my email (I'll send one back but thought I may as well mention it here too.) I really appreciated it that you got back to me so quickly... A great surprise for me! I die for those shoes. Those wedged boots are totally some Chloe-esque shoes I can actually afford. Thanks! "Producing leather—whether by chrome/chemical tanning or vegetable tanning—comes with a host of problems. It heavily contributes to global warming, land devastation, environmental pollution, the depletion of valuable natural resources, and water-supply contamination, not to mention the spread of disease and the abuse of billions of animals. If Stella McCartney and Elizabeth Olsen can make shoes which are completely leather-free, then there are no excuses anymore not to do so. those pink booties are ADORABLE. Wish we had UO here. The photography/idea is really great. Maybe they can get a photo of you swimming under water wearing a pair? I'd love to see that. This collection is quite cute! 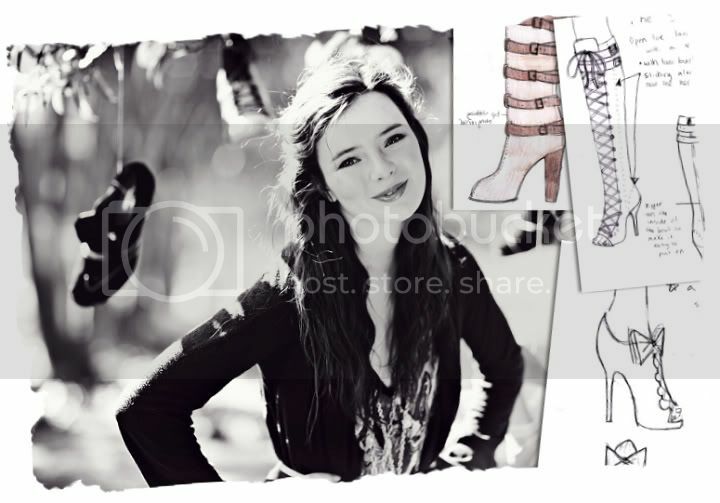 i hope im lucky enought to get my hands on a pair of those lace boots! and i love the ones with the bow but cant seem to find it on UO's website. are they available for purchase? congratulations, they're absolutely gorgeous! and it's nice to get a glimpse of the sketches...sweet. i love those two-tone brown wedge ankle boots. are you getting accustomed to the hair? it's quite flattering on you. it's taking me a while to get used to my darker color, too, but i'm very glad i went for it. i look in the mirror and forget i've gone darker...a bit of a shock sometimes, but what the heck, it's fun to change things up! anyway, best wishes on continued success as a shoe designer, or whatever your pursuits may be! Are the UO shoes unavailable for customers in Europe? :/ I can't find them on the European site. congrats, they're absolutely gorgeous! i especially like the two-tone wedge ankle boots. well done! nice glimpse of the sketches, too...sweet. have you grown accustomed to the hair color? it's quite flattering on you. it's taken me a while to adjust to my darker hue, too, but i'm very glad i went for it. what the heck, it's fun to change things up once in a while! anyway, best wishes for continued success as a shoe designer, or whatever your pursuits! visit me at www.fashionsnag.com for lots of designer shoes! I want to have a better look at the pink one!!! Show please! I want those pink booties so much! I can't wait to get my own pair, such an awesome job you did! Congrats Jane! How involved are you in the prototyping? Do you get to see and critique prototypes & samples? They look so lovely, congrats on all of your success Jane! the brown wedge boots are absolutely amazing! i seriously have to have them. i just started a new waitressing job, so guess where i'm going with my first night's tips once my restuarant opens? to buy those babies, mmmmmhmmmmm. Congrats! The pictures are just lovely. Your haircolour is amazing too. this must be so exciting for you, congratulations! the photo shoot is gorgeous. Wow they look great! Congratulations! janeee they are beauuutifull!!! and as are you!! lovely, you're like the beauty I never found.. hmm the shoes are just extra. damn! is there a way to get them in europe? LOVE the black booties Jane. I need! Soo swag. OMG Congrats! This collection is amazing...I want everything!! Have you heard of this new site (its like gilt.com) ZabaChic.com. 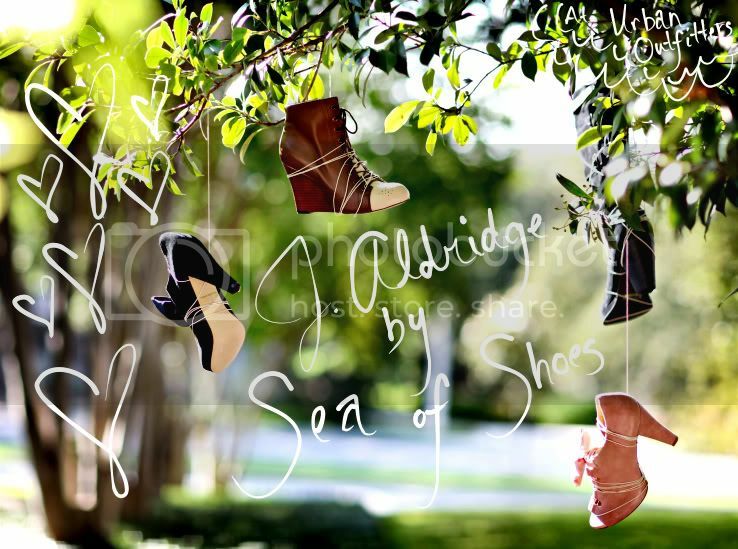 You can get cute stylish clothes for cheap $$$ sea of shoes fans...check it out! congratulations!!! Can't wait to check it out! I love the shoes hanging from the trees. It'd be great if you can wear/style them on your blog. It'd be cool to see how you wear them. The Satin Bow Heels....I just died and went to Heaven.